We’ve been putting Apple’s new 11-inch iPad Pro through its paces for a couple weeks. Here’s our review of this new ‘computer’. 2018 newsflash: I haven’t upgraded my iPad since 2013. 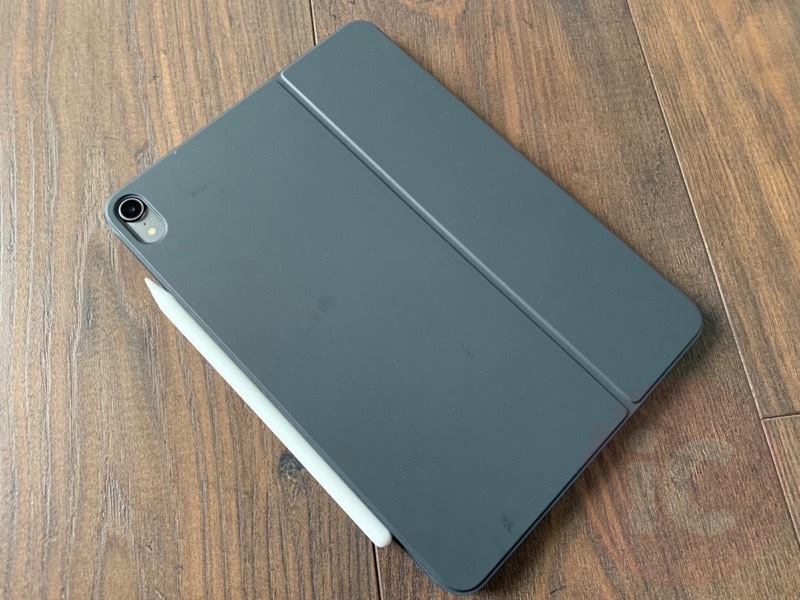 That’s right, I currently have a ghetto iPad Air that our kid has taken ownership of (keyword: borrowing; that way I can take it away) probably since 2015. Since then, I haven’t used my iPad Air at all, relying on iPhone for my night time media consumption or my MacBook Pro with Touch Bar. So heading into this 11-inch iPad Pro review, I feel like I’m new to the iPad and iOS again. With changes to iOS for the iPad Pro, we now have new iPhone X gestures to go with traditional multitasking, splitview and more. With this in mind, let’s get this review started. The iPad Pro is frickin’ beautiful. There’s no other way to put it. This aluminum slate with rounded corners is so thin and feels amazing to hold. 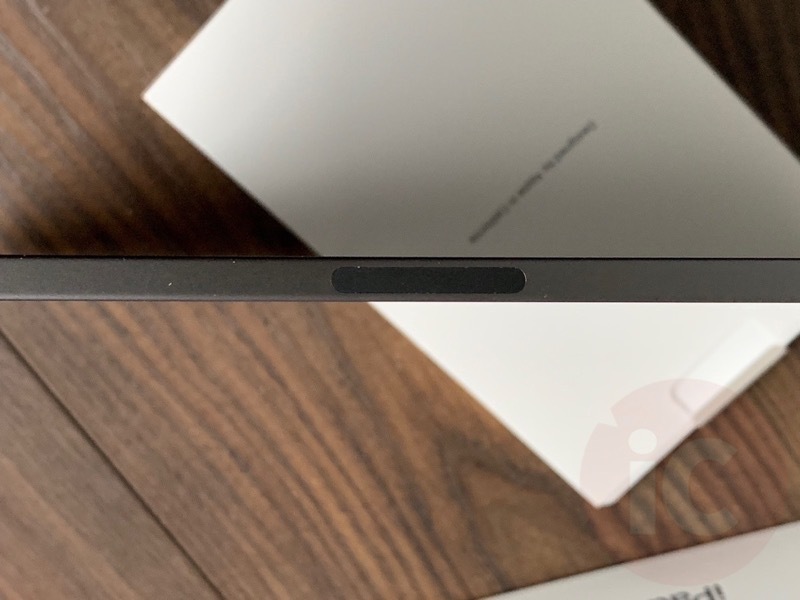 Apple hit a home run with the design, despite the camera bump on the back. 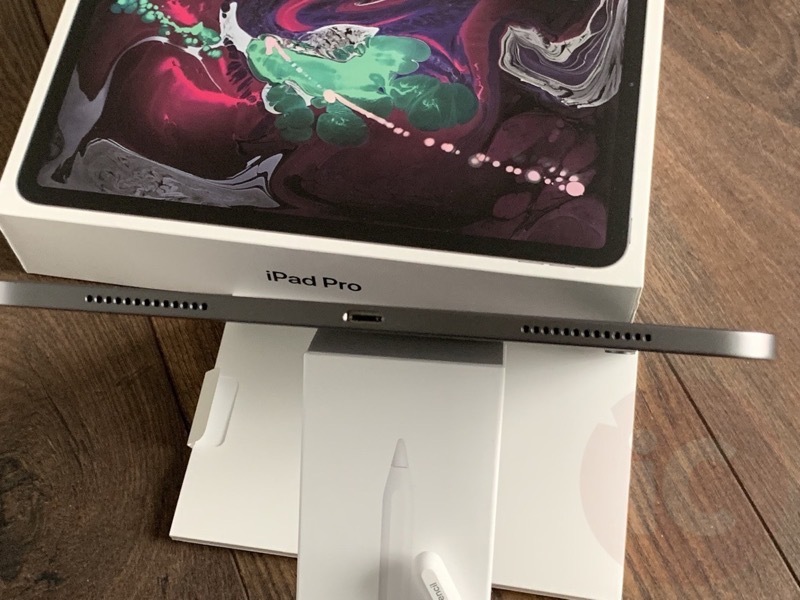 In the box you get the iPad Pro, USB-C charging cable and new 18W AC adapter (which is unavailable for anyone else to purchase–for now). The Apple stickers are still there and the quick start guide. Nothing really new here. 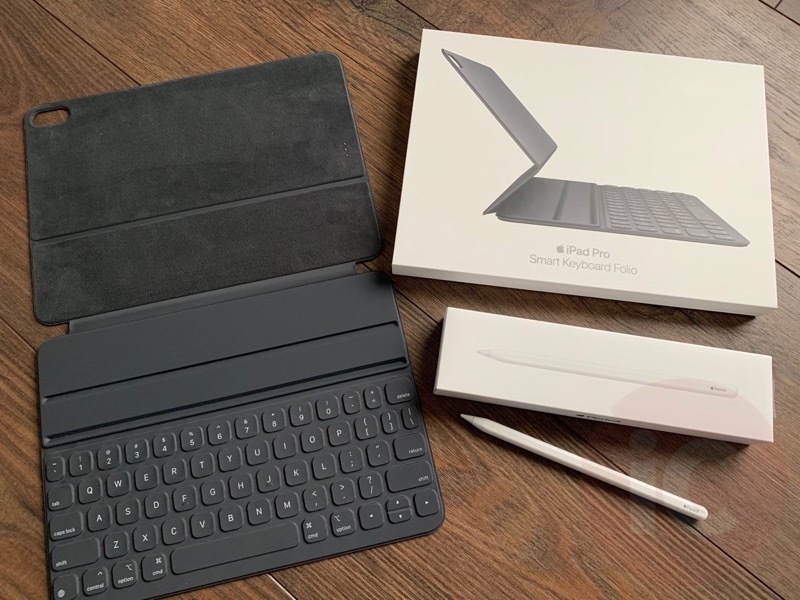 We also picked up the Smart Keyboard Folio and Apple Pencil as well to complete the pricey trio. The Smart Keyboard Folio has two viewing angles. I wish there was a third angle, as I find the desk angle has me slouched over like the hunch back of Notre Dame, because of my taller torso. 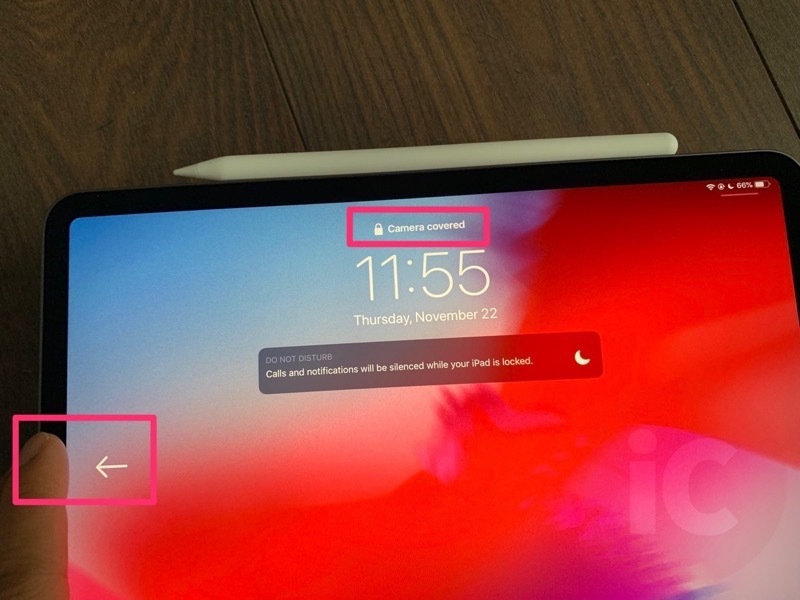 The edge magnets on the iPad Pro are really strong. They attach to the Smart Keyboard Folio with a confident and satisfying click. The edge magnets are so strong it can dislodge the back cover when opening and closing the case. 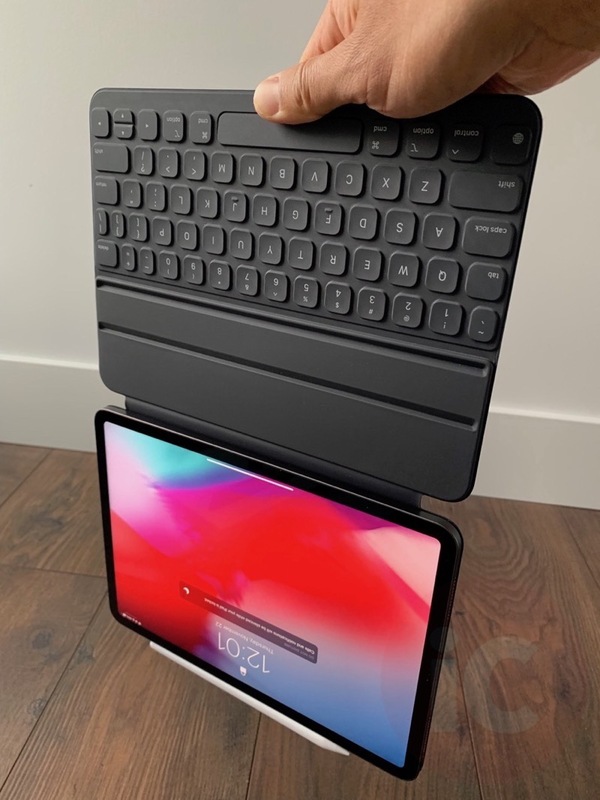 The Smart Keyboard Folio on the 11-inch iPad Pro is too small for my fairly large hands. My hands feel cramped when typing and my wrists get a bit sore. But the keys do feel nice when typing and are relatively quiet, which I’m sure is appreciated if you’re a fake news ‘starving’ student typing notes in class. 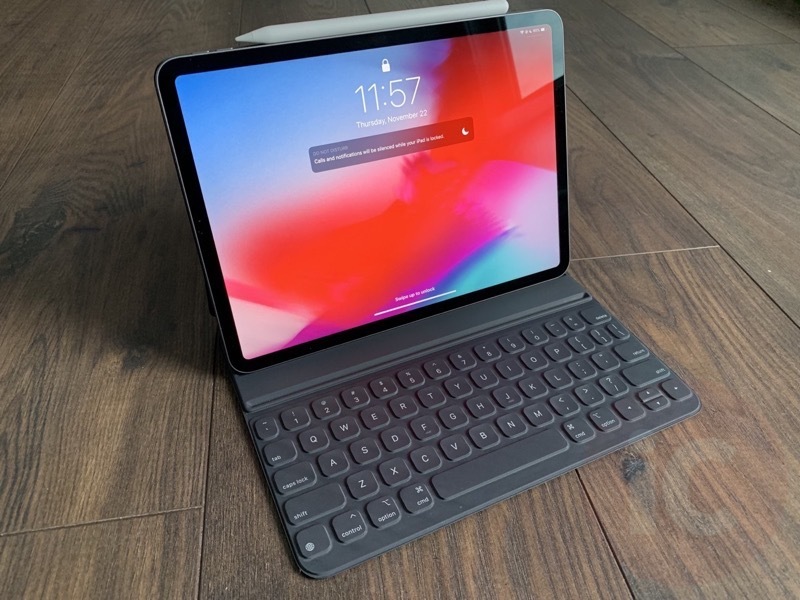 I’m wondering if the 12.9-inch iPad Pro and keyboard would fare better (fine, I just ordered it too). 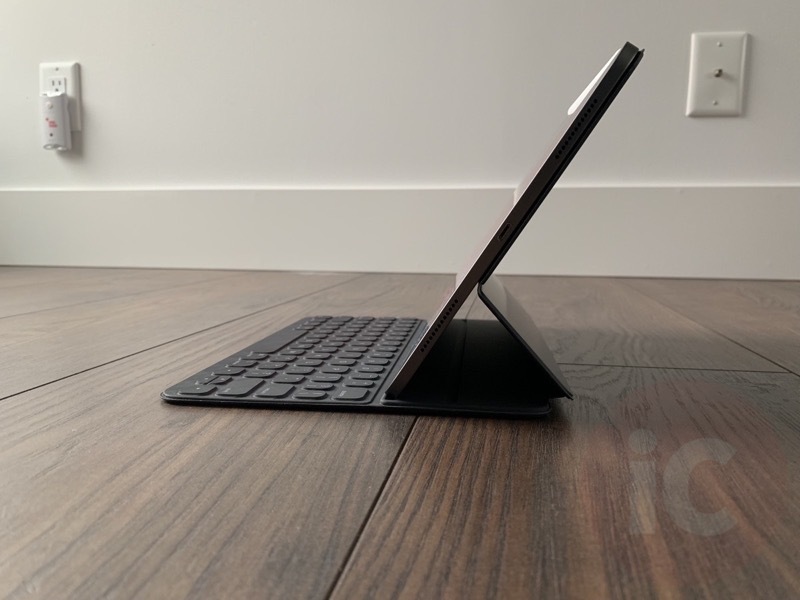 When holding the iPad Pro with the keyboard resting on the tablet…err…computer’s back, you’re feeling keys and the keyboard itself. The keyboard won’t affect text input unless it’s in the angled position, but it does feel weird holding the case and iPad this way. When closing the Smart Keyboard Folio, the keys and any other gross debris (like bacon bits and chips from your lunch) hits your display when closed. I’m curious how this will hold up long term. If you’re worried about scratching your precious screen, buy a screen protector. Also—I keep getting confused as to which way to open the Smart Keyboard Folio properly. My brain has been trained to open the cover like the old Smart Cover when I see the ridge on the top. But in this case, if you do this, you’re separating the Smart Keyboard Folio from the back of the iPad #wakeupbrainorillstabyouwithaqtip. One more thing—a backlit keyboard would be nice and it’s sad it’s not available considering the price paid. Overall, using an iPad with a keyboard is way better than typing on a touchscreen. 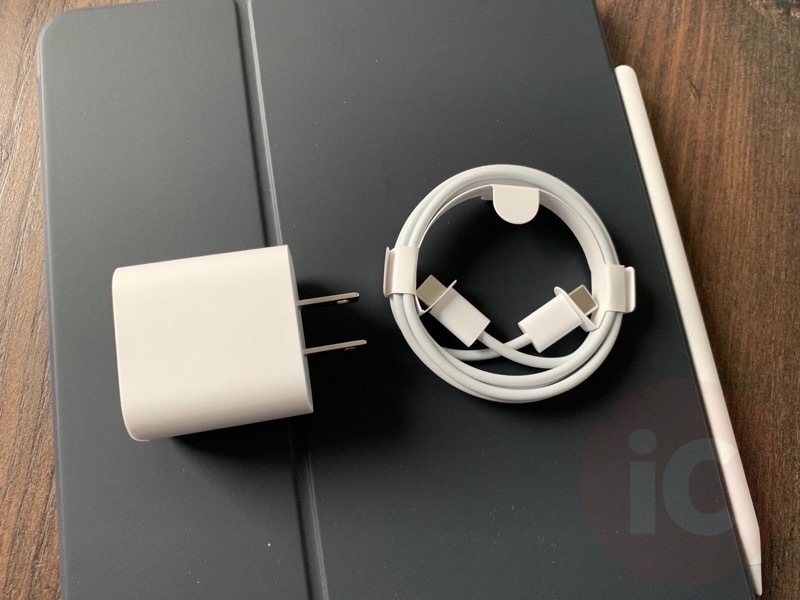 As for the second generation Apple Pencil, it has a good weight to it and attaches securely to magnets on the side of the iPad Pro, where it also charges wirelessly. 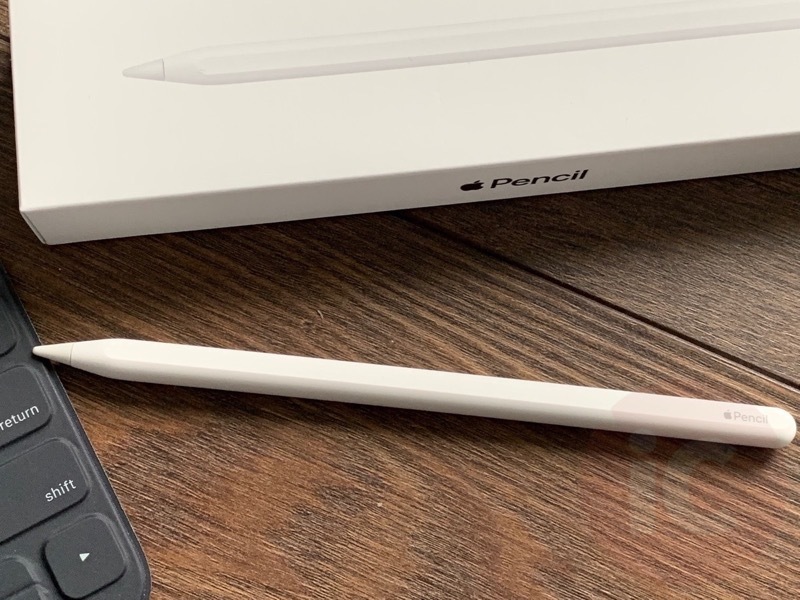 The Apple Pencil pairing process is like pairing AirPods—it’s seamless. Just attach the Apple Pencil to the side of the iPad Pro and voila. As for using Apple Pencil, I’m not an artist or comic book author wannabe, so I didn’t use it much for sketching and drawing, but it’s fun for kids to play with. The new touch gesture on the flat side allows you to switch to an eraser or another drawing tool. It works well but I didn’t use it much. But as a mouse replacement, using Apple Pencil to navigate reduces arm strain, as you don’t need to elevate your arm up as much to navigate. Aside from being an expensive finger extension, I don’t know what else I’d use it for, aside from drawing stick men all day in the Paper app. Here’s my first drawing since grade 5. 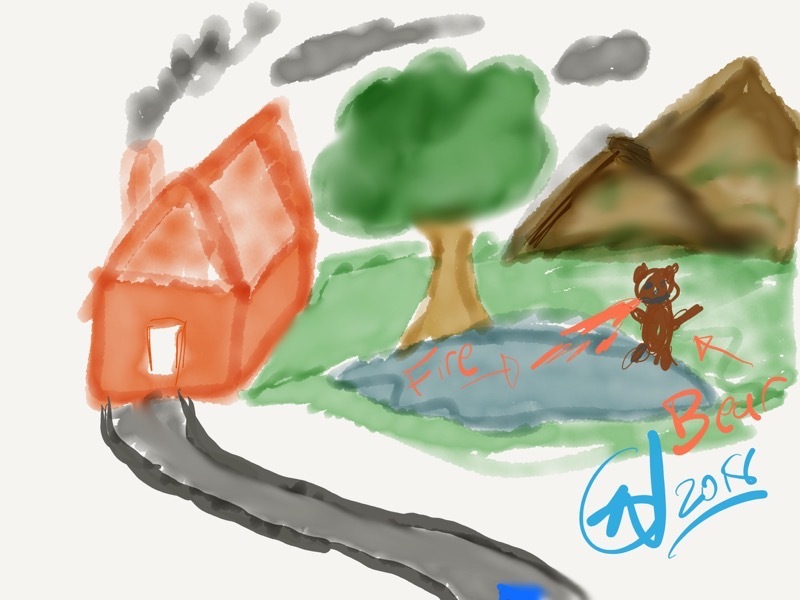 Your Apple Pencil sketches aren’t even on my level, son (yes that’s a fire-breathing bear). By now you may have heard the hardware inside this iPad Pro is ludicrous. The A12X Bionic beats Geekbench benchmark scores of Apple’s 13-inch MacBook Pro. Overall, everything is fast, while ProMotion results in the display being buttery smooth. With so much power in the iPad Pro’s hardware, there needs to be some software to put it to the test. We know it’s possible to edit and export 4K video for YouTube, while Adobe says ‘real’ Photoshop for iPad is coming in 2019. Normally our desktop workflow consists of using MarsEdit to write article drafts, upload to WordPress, make final edits and then publish. On iPad Pro, the WordPress iOS app does not offer as many features and options versus MarsEdit, or using the WordPress Admin UI on the web. Inserting images never looked right as they were too large and had to be resized. Pasting links takes way too long. Changing permalinks requires editing on the web. Resizing and watermarking images is not as easy as it is on my MacBook Pro. 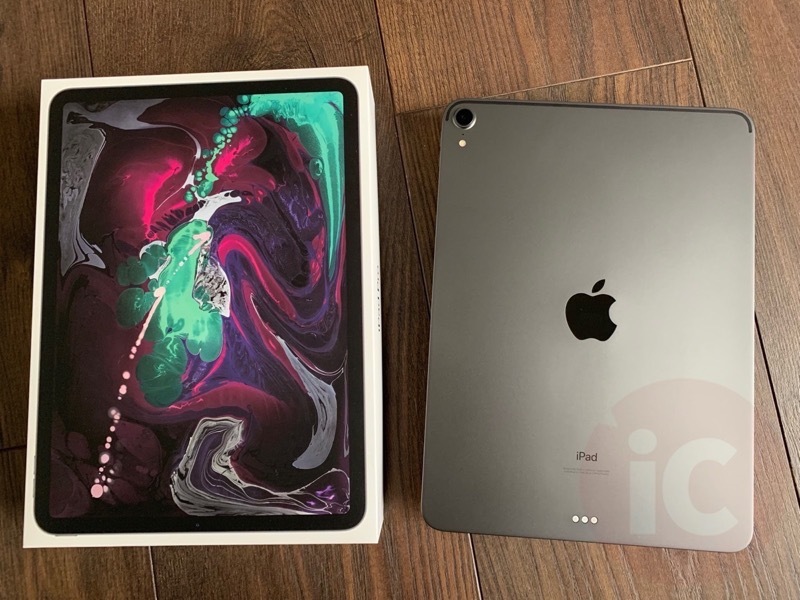 So was iPad Pro able to replace my MacBook Pro for work? Sort of, but not really. For starters, one of the biggest gripes is selecting text and also adding hyperlinks to text. It’s excruciating on iOS. Also, without external mouse support, highlighting and editing text is tedious, even with Apple Pencil. For any time-sensitive work, iPad Pro just takes too long versus using my MacBook Pro. Sure, even with the text highlight trick below, it’s still time-consuming on iPad Pro. But what I did like with iPad Pro was for typing reviews, notes and doing light work that was not time sensitive. iPad Pro makes work fun with the interaction involved. Using my MacBook Pro doesn’t let me relax as much as an iPad Pro can. Consuming media and browsing the web with iPad Pro is just better than using my Mac, as apps and the interface make it feel less like work (I’m thinking of Steve Jobs lounging in a chair reading the New York Times with the first-gen iPad on stage back in 2010). When it comes to ‘real work’ and I have to choose between my iPad Pro and MacBook Pro? Hands down I’d grab the MacBook Pro in a heartbeat. But for consuming streaming media mixed in with casual work on the side, iPad Pro can do wonders. There are shortfalls with the iPad Pro. Sure, it doesn’t accept USB-C storage drives, but I can’t remember the last time I plugged in a hard drive into my MacBook Pro, as most of my documents are in the cloud. 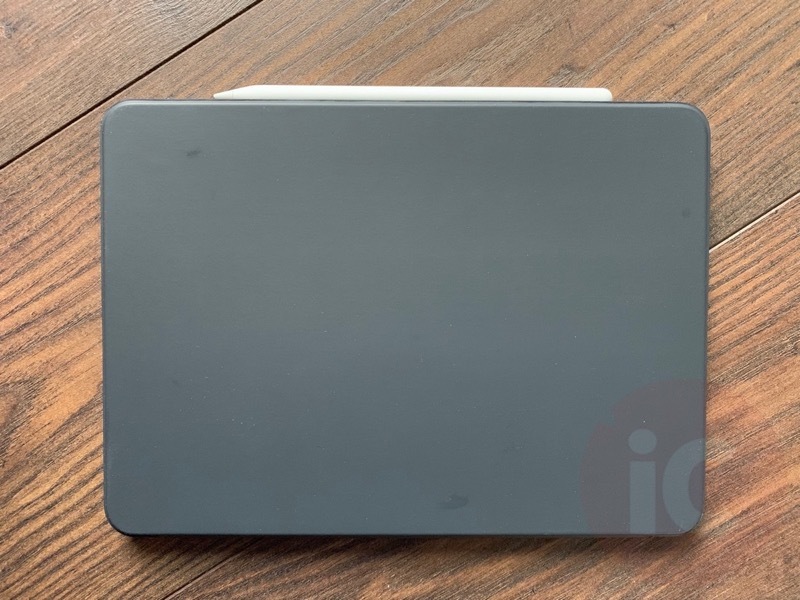 But for those who require file access on a physical hard drive, this is a shortcoming when compared to competitive products like Microsoft’s Surface Pro. 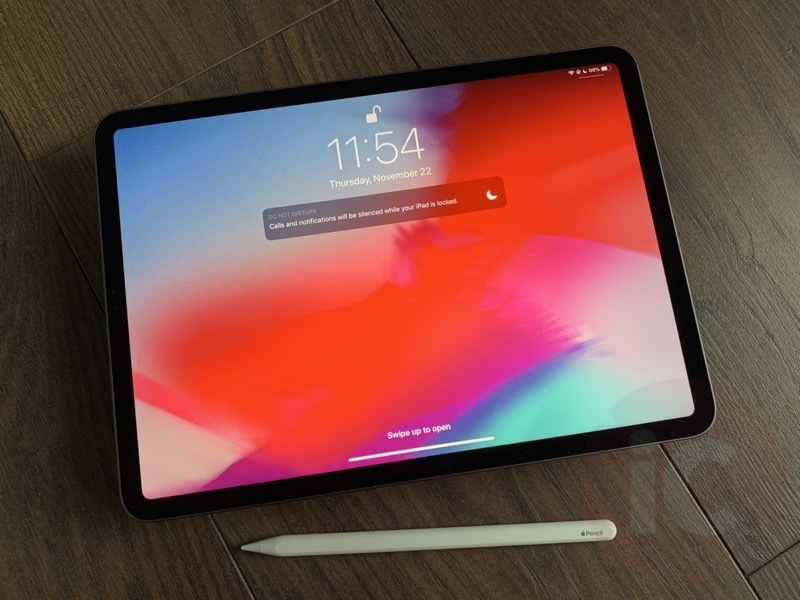 Overall, spending time again with the iPad Pro made me realize it still felt like a giant iPhone in 2018. I was able to do the same work-related tasks as I would on my iPhone XS Max, but in an easier and gorgeous form factor. Hands down, consuming media and doing internet-related things on the iPad Pro is a joy. 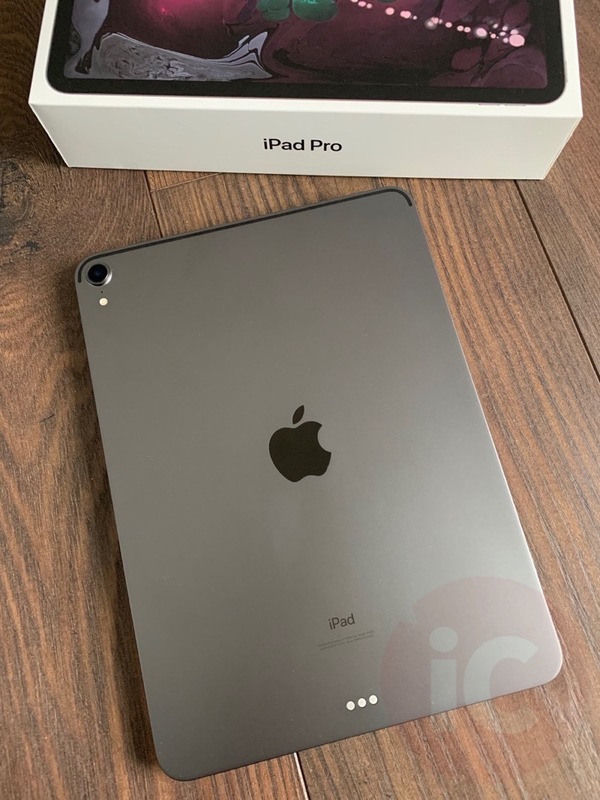 This is the most expensive iPad (aside from a 12.9-inch iPad Pro) to surf Facebook on or to search Google with. It’s definitely a luxury product folks. Face ID works incredibly well in both portrait and landscape. I’m surprised at how good it is for a 1.0 launch on iPad. I still do end up covering the camera by accident when I’m holding the side of the iPad Pro, resulting in Face ID to fail. This is something we will have to live with for thin bezels. 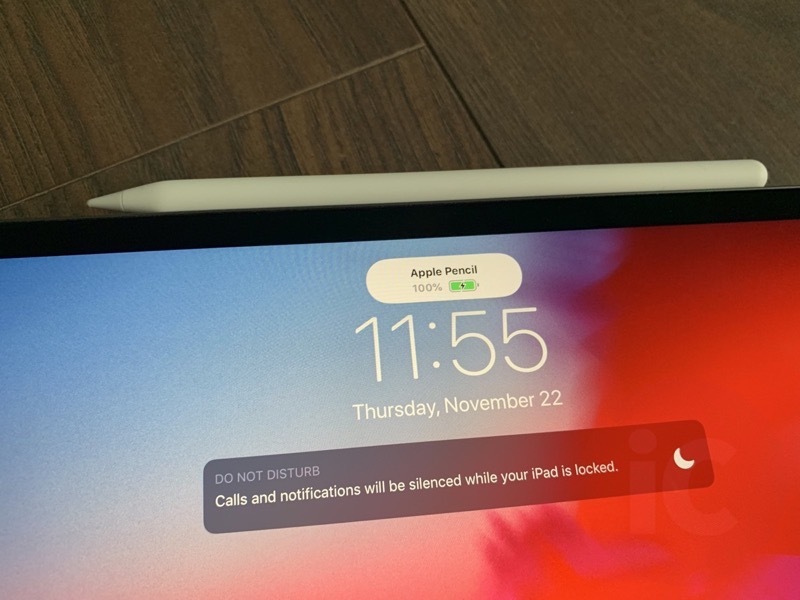 When unlocking the iPad Pro with Face ID, you can slide up from anywhere on the lock screen—not just where the visual bar is. When you have the Smart Keyboard Folio attached, just double tap the space bar to authenticate and skip the swiping up step. In my time spent with the iPad Pro, battery life and standby was decent. Apple advertises 10 hours of battery life. On the first day of my casual tests, I unplugged the iPad Pro from a full charge at 8:30AM. Twelve hours later in the evening, battery was down to 87% after some light usage. By day two, at 9pm at night, I had 59% battery. By day three, the battery finally decided to to hit 1% by dinnertime at 6:20PM. Total screen time spent on was 15 hours according to Screen Time. I didn’t religiously perform a battery test, but I was able to use it for days without charging. I wouldn’t be able to do that with my MacBook Pro. As for the headphone jack, it doesn’t exist on iPad Pro this year, well, because—#courage. 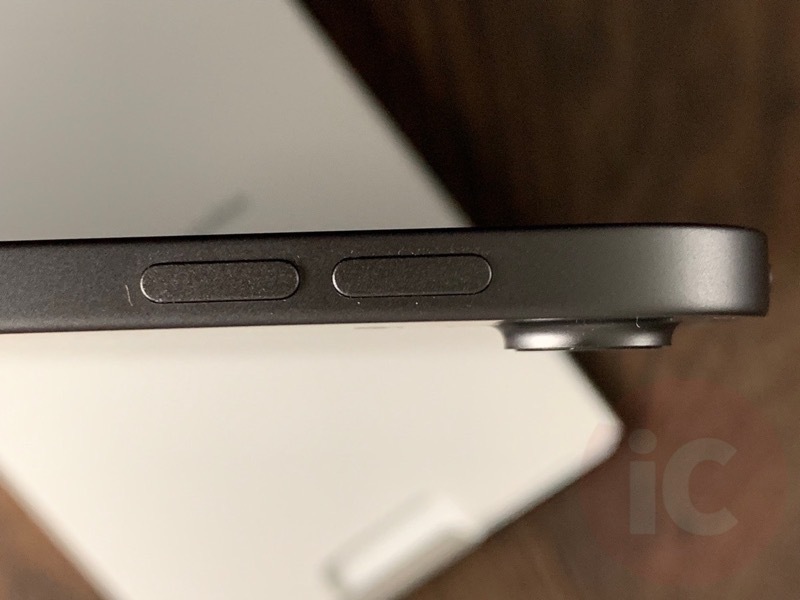 You’d think there would be space to keep the 3.5mm jack, but not according to Apple. You better pony up funds for AirPods already. 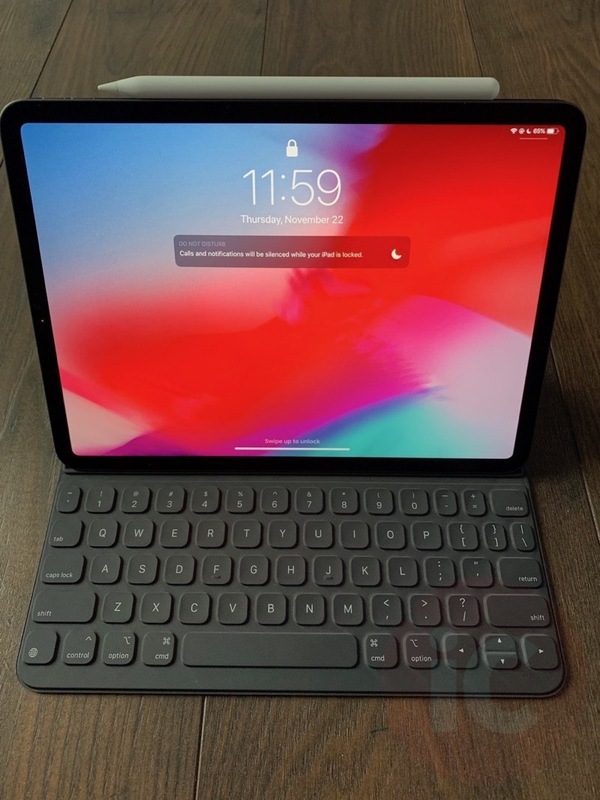 Apple keeps saying iPad Pro and the iPad, in general, is a computer. 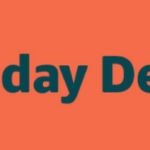 Sure, it definitely is depending on who you’re talking to. If my Aunt Jemima needed a simple email machine, Internet device, media player and more, a regular iPad is the way to go. 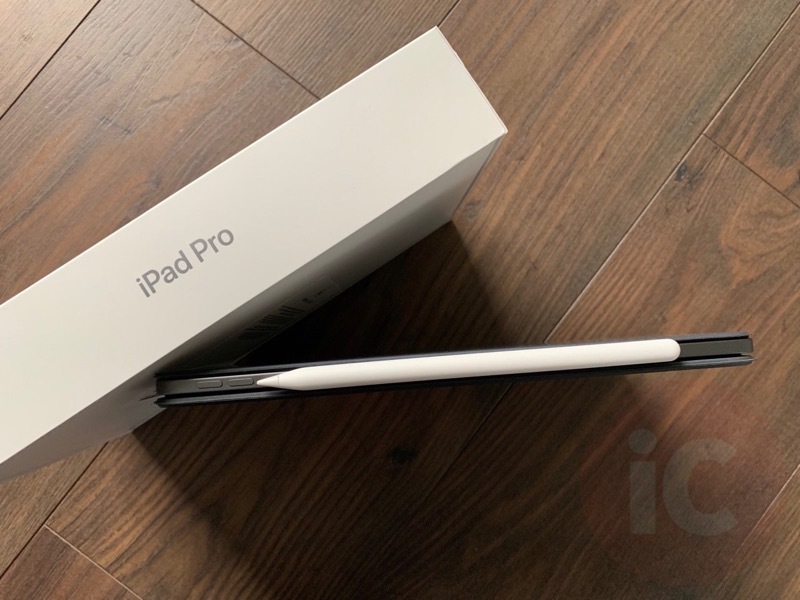 By adding ‘Pro’ to the name and increasing its size and price—does it actually change the functionality of the tablet? 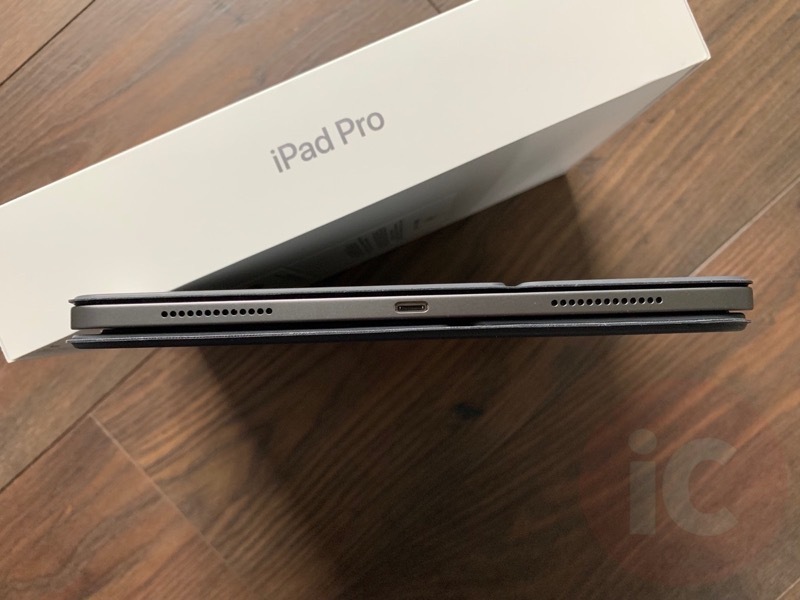 Yes, the hardware is downright impressive, but still, iOS is holding back the iPad Pro. There’s no way this can replace my MacBook Pro when I need to do urgent work, and don’t want to waste half my time on highlighting text properly. iPad Pro is not cheap ($999 64GB iPad Pro + $239 Smart Keyboard Folio + $169 Apple Pencil = $1408 plus tax; $1576.96 in BC). It’s pricey compared to smaller iPads and other tablets, but you are getting some beautiful and blazing fast hardware. At this price, you may as well buy a MacBook Air or even a MacBook Pro. But when it comes to the iPad Pro, it’s still a fun device to unwind with after work hours. 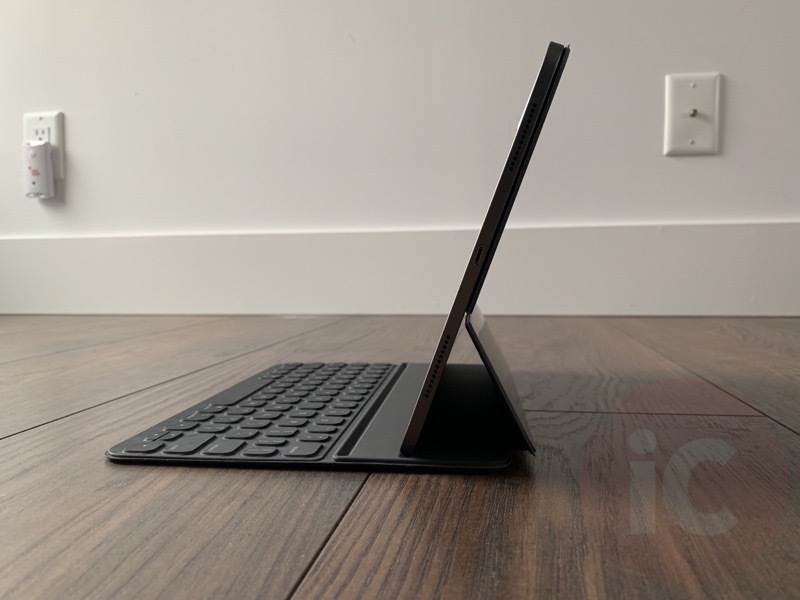 This review took me longer than expected to write (also because 90% of it was typed on this iPad Pro). I wasn’t sure how to describe my iPad Pro experience this time around, after using an iPad Air from the past. What I can say is the iPad Pro feels great to use and I am able to do light work on it. The hardware and display are ‘top drawer’, especially for consuming media. But for me, real work can be completed much faster on my MacBook Pro. iOS 12 isn’t there yet for me when it comes to a full-time work machine, as the iPad Pro is just there to fill in the gaps in between my iPhone XS Max and MacBook Pro. That being said, I haven’t been able to put this thing down (that is until my 12.9-inch arrives). 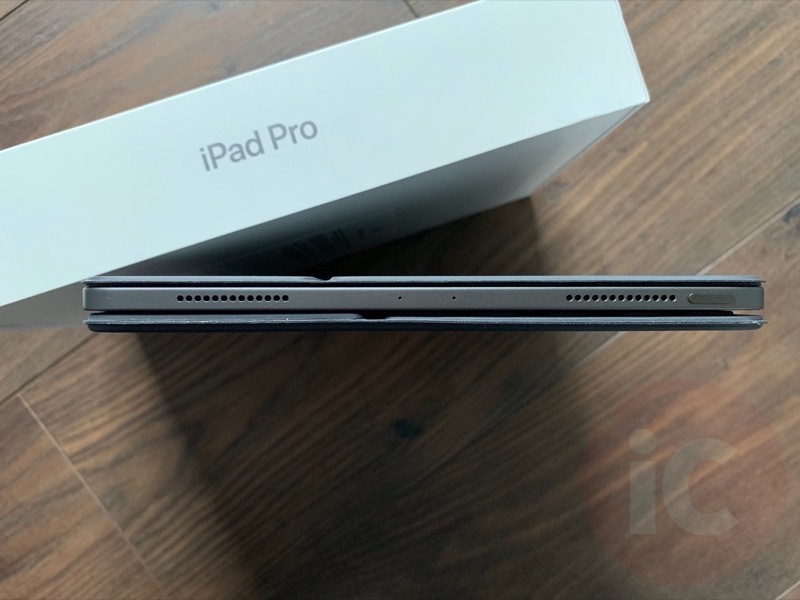 How are you liking your 2018 iPad Pro?